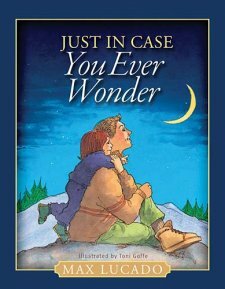 I was so excited to see Just In Case You Ever Wonder in the list of books available for review through BookSneeze from Thomas Nelson Publishers. I have been reading this book to my now nine-year-old boys and five-year-old daughter since they were small. As all my children are adopted and have their own unique stories, I have enjoyed adapting the storyline to fit their specific circumstances as I read it to them. It has always been priority to be sure my children know about God and His saving grace through His Son Jesus Christ. Just In Case You Ever Wonder has played a part in achieving that purpose. My one issue with this book, and it is a big one, is that Lucado fails to mention Jesus Christ in this book at all. He writes about what a wonderful place heaven is, and how “In heaven you are so close to God that He will hug you, just like I hug you.” But failing to even mention how we get to heaven, that faith in God’s Son Jesus Christ is the only way anyone will enter into heaven, is a major flaw in this otherwise awesome little book. But, as I said earlier, when I read this to my children, I have taken liberty to ad-lib the truth of Jesus’ saving grace into the story. It just works …. just in case you ever wonder. I would definitely recommend Just In Case You Ever Wonder as a wonderful God-centered bedtime story, but would suggest including Jesus in the story so children will hear the whole truth.